A Matter of Memories: :SALES: 10% off all NEW products at Scrapbook.com...today only! :SALES: 10% off all NEW products at Scrapbook.com...today only! 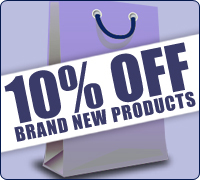 Add any BRAND NEW* item to your cart today to receive an additional 10% discount at Scrapbook.com...today only! No coupon code is required. The discount will be applied to all eligible items in your cart and will appear at checkout. Hurry, this offer expires at midnight PST. *All products where name includes "BRAND NEW" are eligible once they are added to your shopping cart.